GFA members enjoy benefits such as family events, trips and help with research. Send an email to Ken Graves requesting the Bulletin. Provide your postal mailing address to be included in events in your area. Please tell us about any errors, broken links, or other problems so we can fix them. Order Y-DNA (37 markers minimum recommended), mitochondrial, and/or autosomal tests. This link is for new customers. If you are already a FTDNA customer, order from your personal page. No GFA events scheduled at this time. If you would like to schedule or host a meeting or other event, contact Ken Graves by email, or send a message from the contact page of this website. More details on reunions and trips. Steve McQueen is a family member descended from John Graves of Northamptonshire, England & VA (gen. 270). 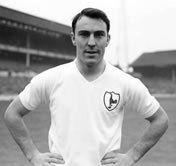 Jimmy Greaves was one of the greatest English football (soccer) players of all time. Can you help us find his ancestry? We are a voluntary, non-profit organization that is interested in the surname of Graves, Greaves, Grave, Grieve, Greve, and all other variations of that name for all time periods, worldwide. It is not necessary that you join the Association to be helped by us, but you are urged to do so. Your financial contributions and your working with us to further the programs of the Association will benefit everyone. Explore the wealth of information on this website by investigating the links on the drop-down menus at the top of this page. The origin of the surname, the early history, and famous family members can be found on the History/News tab. Alphabetical and numerical listings of the many Graves/Greaves families, African ancesry, and a summary of some of the research programs are on the Research tab. The DNA tab gives access to information and charts for Y-DNA, autosomal DNA, etc. The Products tab provides access to books that have been published, previously-published Graves Family Newsletter issues, and the currently-published Graves Family Bulletin. To find out more about GFA activities, visit our Facebook page, subscribe to the online Graves Family Bulletin, and join the Graves DNA project. In addition to those activities, genealogies and charts are continually being updated. Join and learn more! Autosomal DNA testing is becoming increasingly helpful. This is a technique to test the mixed DNA that we all inherit from both our mother and father, and from all our ancestors. It has the potential for a major impact on finding and proving ancestors and other relatives. Several new autosomal charts have been created and can be accessed from the Autosomal DNA page on this website. We need everyone's help to add to these charts and to provide more information for additional charts. Look for more on this website and in the Graves Family Bulletin in the future. We suggest that everyone (both males and females) take this new test (Family Finder at Family Tree DNA and Relative Finder at 23andMe). You can sign up by scrolling down this page to the DNA Study section and clicking on the link for "How to sign up." There are new search capabilities for the entire website and for the genealogies on it. You can search for anything on the website by clicking on the slide-out tab at the top left of every page and using the top search option. Since this is a Google search of the site, all the standard Google search features apply. To search the genealogies for a specific person, a spouse, a date of birth or death, or any combination of those, use the bottom option on the slide-out tab or access it from the drop-down Research tab at the top of every page. For this search of the genealogies, only the exact sequence of characters in each entry field will be found, so often entering less is better. For instance, you can now find every occurrence of a Graves who married a Jones or someone named Eleanor, and then just click on the link of interest to take you directly to that genealogy. We expect that this new genealogy search capability will allow you to find people and their families that couldn't previously be located. Let us know if you have questions or suggestions. The Graves Family Association Facebook page was started in Oct. 2011 and had 448 members as of October 4, 2012. By April 22, 2017, that number was 1757 and still growing! You can click on the Facebook link just under the Coat of Arms at the top right corner of this page to go to the Facebook page and join if you want to. Let us know how you like it. An impressive new research study has determined that John Graves of genealogy 270 may have been a son of William Graves and Ann, who were named as headrights in 1658 in New Kent Co., Virginia. This detailed treatise is now available on this website. Hard-cover books of many of the major Graves and Greaves families are still available for sale. To see the list of 7 books already published, with prices and ordering instructions, click on the Products tab at the top of this page, or click on this link. Check the Charts page for the many new and revised genealogies that are constantly appearing there. The lower portion of that page also contains groupings of related (or possibly related) families. We are trying to get at least one male descendant with the Graves/Greaves/Grieve(s) surname for every genealogy listed on that page to participate in our DNA study. If you see that your part of the family doesn't have at least one tested descendant, you or a person you find may be eligible for a free test. Traditional genealogical research will never find all the connections between the various Graves/Greaves family groups. The availability of Y-chromosome analysis now provides a new way to determine direct male-to-male lineage, and this continues to be the most important part of this project. However, the usefulness of mitochondrial DNA has been gradually improving, and now the availability of autosomal DNA testing (to trace all ancestral lines) has greatly increased the potential of DNA testing. How to sign up (The 37-marker test is recommended for Y-DNA.) This link can also be used for mitochondrial DNA tests, autosomal DNA testing, and Y-SNP testing (including Big Y). Overview of Y-DNA test results, including links to detailed charts and tables of results. Simplified Y-haplogroup chart, showing the general relationships between the various families. Numerical List & Charts Be sure to check at the bottom for groupings of related genealogies. To locate a specific person, place, or other item in the genealogies or anywhere else on the website, use the search option at the top left of every page of this website. There is no new research puzzle this month. If you have one that you think should be included here, please let us know. For more details on previous research puzzles, go to the Research Puzzle Page.